A blog and The Life In Between : A guide to Maldives. Travel guide for a budget friendly getaway to Maldives. This was our second time going to Maldives and while some of you might ask how can I even be able to put together a travel guide after just two times going there, let me tell you it's a freakin' experience to even get to that side of the world lol. It's one of those trips where there is lots of planning, googling and researching before even booking the trip so I'm here to put it all into one blog post and let ya'll know how to do Maldives, what not to do and most importantly how to do it on a budget. 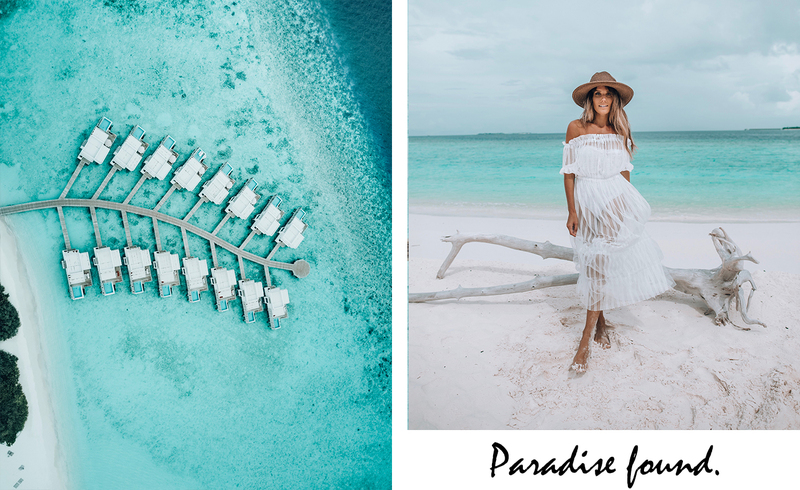 Before I even get into the details about this paradise I want to be honest with ya'll that I did work with the hotels during our stay, however it does not affect this post as I myself was shocked about our experience this time compared to last time & as you read you'll find out why! Whether you're planning a honeymoon or a vacation Maldives simply happens to be one destination that everyone has in their bucket list. It's a tropical paradise that is literally surrounded by nothing but turquoise waters and over water bungalows with private pools that happen to also have ocean away just a few steps down. Sounds like a paradise, right? It sure does but it might come with a large price tag if you chose the wrong time to go or the wrong place! I personally do not recommend Maldives for those that crave an extremely active lifestyle as Maldives is a place that is meant for relaxation. First time we came here was about 4/5 years ago and it couldn't be more wrong of a timing. We were young(er), were looking for adventures and didn't know how to appreciate sitting down and relaxing. While we still enjoyed the islands & spend a fortune we didn't feel like we enjoyed it to the simply because it happened at a wrong time. Well, at least that is how it was for me (pretty sure Adam would just say it was just as amazing lol, so this is simply based on my feelings and experience only). If you expect a very private vacation, know how to sit back and relax you will absolutely love it! August - October happen to be the slowest season of Maldives due to unpredictable weather. If you look at the weather right now it will show that it will rain every single day, however just like any other tropical island in the "winter" that just means as little rain as 5 mins - 1 hour a day which shouldn't matter if you can save thousands of dollars by choosing to go during the slower season. We spent over a week in Maldives and it rained almost every day, however we got more than half of a day of sunshine each day and the weather was perfect as it was sunny and in 70s. P.s. First time we went to Maldives it was in November or December and we didn't see a rain drop, weather was perfect - however it was slightly too hot and I left the islands looking like a lobster (too tan, which shortly peeled away and not in a cute way lol). Before you book the flights make sure to have a hotel in mind, find out the best way to get there. Hotel will be arranging your pick-up from the airport, they will advise you on the best way getting there whether it's a sea plane or a boat (that of course is an additional charge). When flying into Maldives I highly recommend flying into the airport in the morning that way by noon you are transported to your hotel by noon and get to spend a day there. If you fly into the airport in the evening you will waste your money on an expensive one night stay at a resort without enjoying the day because you spent the day traveling or you will book a night to stay in Male (main island where airport is) and trust me it is nothing what you'd expect so try not to make the mistakes we've made in the past. 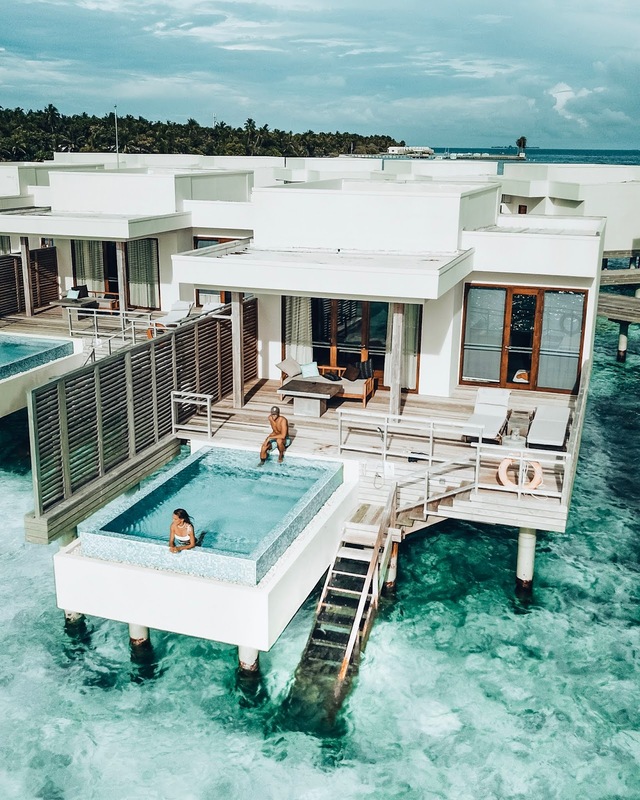 If you visit popular travel websites you will most likely see flights pop up as high as $2000 and while that might seem normal as Maldives happens to be across the globe - it is not! We always book our flights via "google flights (on HERE), the website has lowest prices available at all times no matter where you're heading to and the best part is the prices never change. Another great part about it is that you can view prices a few months in advance without even picking a date! Our flights were $700 round trip each and we booked them 2 months before. First time we came to Maldives we stayed at the W. Adam took care of everything from flights to hotel as it was a surprise trip as we were together for about a year. While it was a great getaway and an amazing hotel it came with a LARGE price tag. Fast forward to now when I started talking to Dhigali hotel of Maldives prior to the trip I was surprised at their hotel prices when I saw online. Even though I was working with them I was shocked how affordable their pricing was for the guests that were staying there! At the moment the rooms are as low as $307 / night which also include breakfast + dinner! Umm.. yep, I'm not even kidding it is literally a dream come true that they've made a paradise like Maldives available for all without jacking up prices so no one could experience it. 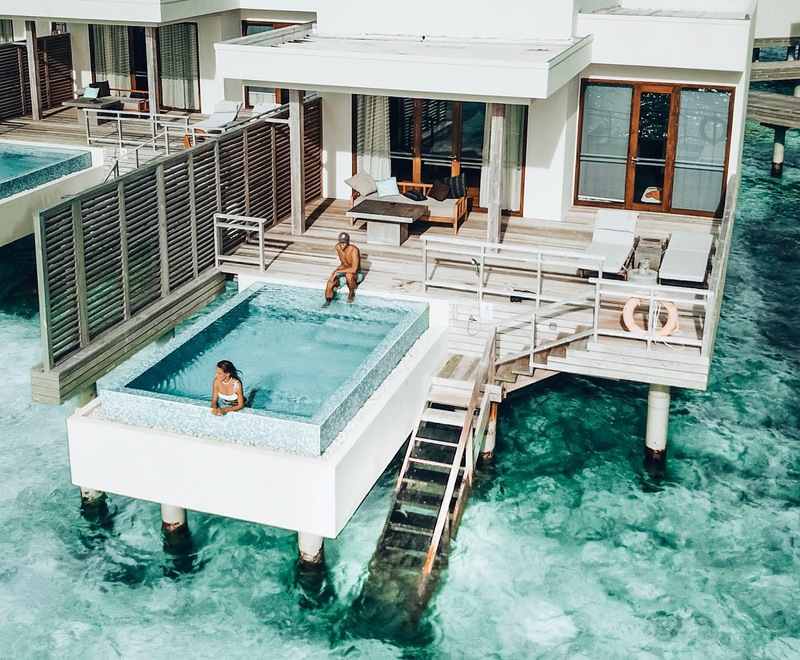 If you're feeling more luxurious or planning a trip to Maldives for a honeymoon you might want to do it in a more private, fancy way which would be getting an overwater bungalow which at the moment is $1000 / night which still includes breakfast and dinner. When we got to the hotel we actually didn't know it was food inclusive and we brought a bunch of snacks as we're always wanting to snack and island always only has one store with extremely limited items ( 1 kind of chips/1 chocolate etc.) We were pleasantly surprised and shocked about how good the food was, while I wish I could fit more into my belly I couldn't as I wasn't used to eating so much so I went along with my regular eating habits while Adam took a full advantage of all the food they offered and let me tell you food was beyond delish so the fact that it is included in the price was mind blowing to us! Dhigali also offers quite a few restaurants, has a small grocery store, gym etc. pretty much anything and everything you may need during your stay there! However, if you want your daily snack like hot cheetos etc. you have to bring it yourself because you will not get your hands on it otherwise lol. P.s. After Dhigali we went to Velassaru which is a sister hotel / owned by the same company which was just as affordable and closer to the airport. I will put together another blog post on Velassaru as well so stay tuned! Dhigali had plenty of activities that they offered during the stay such as scuba diving, movies outside, outdoor yoga as well as a fun night that happens once a week where you get to meet all the employees of the island etc. Hotel also has it's own app which was super helpful because the island itself was 1KM long and we were pretty much always too lazy to walk so we kept tracking the rides that the island offered, that way they'd drop us off wherever we were going to hehe. Snorkeling is complimentary during the entire stay so make sure to take advantage of it as it is pretty amazing to just walk out of your room and go swim in the ocean and explore! To pretty much sum up this entire post I'd 100% vouch for Dhigali hotel for your getaway as it's extremely affordable and offers everything that a hotel that is $3000 a night will! I really hope this blog post answered most of the questions I have gotten and will help you book your getaway to this dreamy spot on a budget as I think it is one place of the world every couple should experience. Don't forget to activate your international plan as your stops along the way to Maldives might include places like China that literally have the entire network blocked lol and you will not be able to search anything online without your plan (happened to us clearly.. lol). Don't overpack. We took a carryon each, mine including 5 swimsuits and 7-10 outfits that were either dresses / shorts / tops etc. Go during the slow season, take a risk & save your money! Instead of going for 3 days go for 5 in case weather goes bad but it's still a paradise and you'll get plenty of sun either way. If you do end up spending a night in Male and booking one night there after you land just know that there is a few grocery stores on the entire island / city offering a handful amount of products / pretty much no clothing stores, so forget shopping and it's a dry country so don't even bother ordering a mojito. Sea planes + boats to your resort are additional charge on top of your bill. While gratuity is included, bring cash to leave for the maid that will be cleaning the room on daily bases. Thank you Dhigali Maldives for partnering me on this post. Thank you for providing such valuable tips! We've never been and this was incredibly helpful.. such great photos!! Worth it to save a few thousand dollars too! I went there once it was so beautiful. I want to go again.